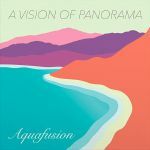 Review: Having thus far released EPs for Aficionado and Music For Dreams, A Vision Of Panorama return to their regular haunt Mellophonia to expand on the promise of their shorter works to go deep into a Balearic dream on Aquafusion. It's a perfect meditation on serene funk from start to finish, spanning eight tracks of tender musicianship that sit very easy on the ears. The likes of "Surf Blue" almost do away with drums entirely in a quest for calm, while "Barbados" and others offer up a more sprightly vision of 80s-flavoured groove, but throughout the mysterious hands behind the record maintain a smooth and steady mood that binds the album together.